What is the Great American Read? PBS with the help of people all across our nation, has created a list of America’s 100 most loved novels! And starting Tuesday, May 22nd at 8pm Eastern Time, PBS will begin a summer series hosted by Meredith Viera where the viewers…and actually perhaps we should say the readers…will help narrow the list down from 100 to 1. 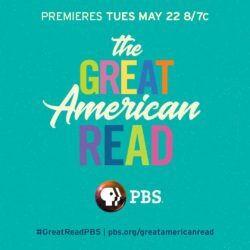 When this PBS summer series is done, millions of readers choosing from books on this list will cast their vote for their all time favorite novel. And in the end, a single book will be declared America’s favorite! We here at the MoonPie General Store and the Original Book Warehouse, being booksellers and book lovers, think this is a fun and wonderful idea! Of course! We’re in favor of people reading books! And we’re also in favor of celebrating some of the great novels of all times as we journey together to picking an all time favorite! And remember how you when you were on vacation, your parents took you to a museum or historical site? Suddenly without even realizing it, they had mixed in a little education with your trip, and you just thought you were having fun! And you were! So hats off to PBS, because as you and I lean into summer, we might just find ourselves reading a good book, perhaps a classic novel from this top 100 list that starts the PBS countdown to the top book. And maybe…just maybe…we’ll all find ourselves flipping the channel away from basketball playoffs, Family Feud, Trading Spaces, NCIS, The Voice, or whatever we love to watch on tv…and the next thing you know…we’ve read a book or two AND we’re watching PBS! Hey! This is fun! And don’t you look good, and feel good, sitting out on the porch while reading that book in your hand!